What do you do with all of those sewing machine bobbins in your sewing room? Store them in one of Fred's Sewing Machine Bobbin Caddies, that's what! These caddies are hand-made out of local hardwoods in my shop near Camptown, PA., not made from plastic in some sweat shop in China! They are heirlooms that will be passed on down the line of quilters in your family for generations to come. Each caddy is hand-signed and dated by me to add to its value! I have designed well-thought-out attractive wooden caddies for "L", and "M" bobbins, a "B" caddy for the 700 and 800 series machines and, recently, my two "Hybrid" models which incorporate 2 tubes for the M or Bernina 700-800 bobbins and 5 for L-bobbins (7 tubes total). "L" bobbin caddies are for the smaller sewing machine bobbins (approximately 7/8" diameter) seen in nearly all domestic sewing machines and in some longarm machines as well. 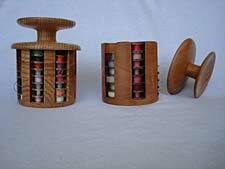 "M" bobbin caddies are for the larger bobbins (approximately 1" diameter) more commonly used in longarm machines. "Bernina-8" bobbin caddies are for the Bernina 700 and 800 series bobbins that are approximately 1 1/16" diameter. Ricky Tims asked me to make the Hybrid version that would incorporate both B and L bobbins in one caddy. I now have both the version requested by Ricky, but I make a hybrid M and L caddy also. I can make any combinations you need-- just ask! When purchasing a caddy be sure to get the one for your particular bobbins as they are made to fit only the specified sizes. If you are not positive about whether you need an L, M, Bernina-8 or Hybrid caddy, CONTACT ME prior to ordering and I can assist in your selection. Fred's Sewing Machine Bobbin Caddies are made of Red Oak or Pennsylvania Black Cherry and now, Black Walnut, your choice. If you have specific needs, I could also make them from other woods. Let me know and for a slight up-charge I might be able to accommodate you. Each caddy is individually hand made and consequently will vary in detail. They are all hand signed and dated. In general, they are a bit over 3 inches in diameter and about 5 inches tall (with the lid in place). Each "M" and "B" bobbin size caddy has 6 bobbin tubes that will individually hold 7 bobbins (total 42 bobbins per caddy) while each "L" bobbin size caddy has 8 bobbin tubes that will individually hold 8 bobbins (total 64 bobbins per caddy). The "Hybrid" caddy should hold approximately 14 B or M bobbins in two tubes and 40 L bobbins in the remaining 5 tubes. Some bobbins vary in thickness so the numbers that I give above may vary slightly with the type of bobbin you use. If you need more (or fewer) bobbins in the tubes, let me know and I can make yours taller or shorter to accommodate more or fewer bobbins. Each caddy is fitted with its own screw-on top that will safely contain the bobbins in the caddy while traveling. The advantage of my bobbin caddy system is that once the bobbins are in the caddy and the lid is attached, there will be no spillage! 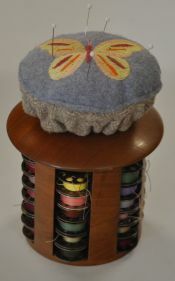 Also, each bobbin is visible and easily available in one convenient attractive storage system.The attractive caddy is made to sit proudly displayed in your sewing area! Val has come up with a nifty pin cushion to place on the lid of your caddy. Click here for her instructions. Val recommends that you put all of one kind of bobbin in a tube so you can easily find a color or thread type. I personally think that you should mix them up so you can spend more time looking at the caddy (but then, I'm a guy)! Use the bobbin caddy to hold thread that you want to use for hand sewing. It is very convenient to have all of the colors of thread visible and simply pull what is needed from the bobbin and snip it off for threading your sewing needle. If the thread ends dangle from the caddy after putting the bobbins back, simply cut off the extra using a sharp pair of scissors. This will keep the caddy looking neat and prevent the thread from unraveling. These make GREAT GIFTS!! Ask me about multiple caddy discounts. Enjoy the caddy and let me know if you have other ideas of wood-related items for quilters that I can make. If I adopt your ideas I'll give you a free item for your efforts!